Saturday, June 9, 1888 Not as warm & looking quite likely to rain, but none fell. All appear about as usual, & busy as ever. Think Charlotte didn't get out at all & had no callers. Of course little girls about as usual, & over at "grand pa's" once or more during day. As well self, & busy at usual chores with some extra sweeping A.M. commnc'd lidy of "bed spread" pattern in April No Household. Sunday 10 No warmer, & more clouds than sunshine. Our folks on hand in good season. Ellery out to service, A.M. & think at s-school. 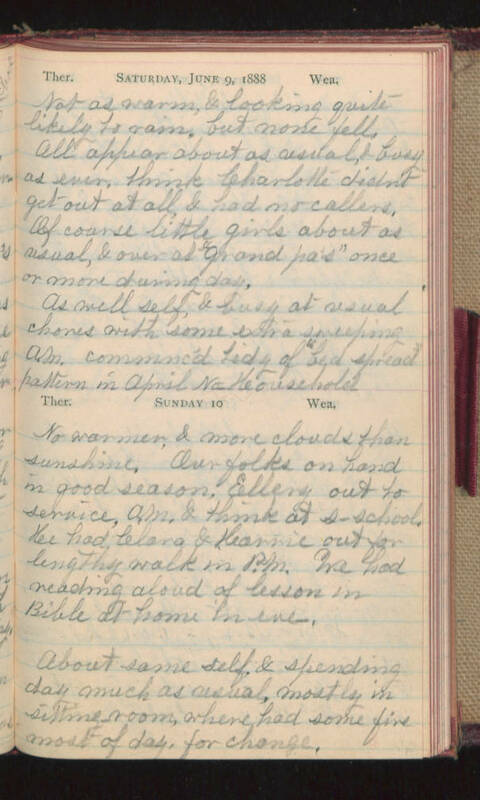 He had Clara & Karrie out for lengthy walk in P.M. We had reading aloud of lesson in Bible at home in eve. About same self, & spending day much as usual, mostly in sitting room, where had some fire most of day, for change.